It has taken the better part of eight months but Android Marshmallow has finally broken through the 10% barrier when it comes to the install base. The latest report was provided by Google yesterday and it shows the latest version of Android is now on 10.1% of the devices that came to the Google Play Store the 7-day period ending June 6th. That is a jump of 2.6% over the course of the report from last month. Given the number of updates carriers and manufactures released throughout May, the jump itself isn’t surprising but to move the needle over 2% is tough when we are talking about millions of devices out there. previous versions of Android have now had a drop in install base for 4 consecutive months. The challenge of course is that it took 8 months to hit 10% for Marshmallow and with Android N just months away from release, the question will be just how high Marshmallow ever gets. This speaks to the well documented problem Google faces when it comes to upgrades to Android from carriers and manufactures. Google appears to be set to try to tackle this problem which not only benefits them and developers but consumers as well by making sure the latest and most secure version of the OS is running on their devices. 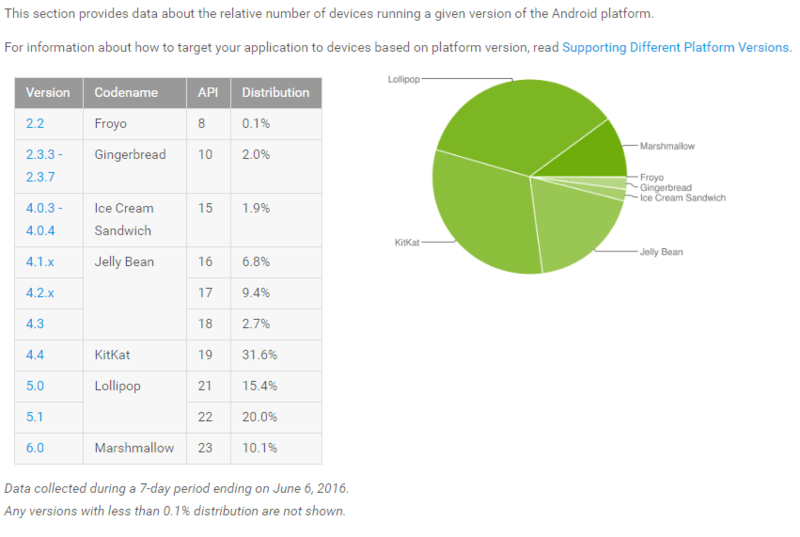 In reviewing the analytical information for ClintonFitch.com, nearly 47.82% of you are running Marshmallow 6.0.1 while another 14.27% of you are on 6.0. That is an increase of nearly 5% and 2% respectively. That means over 62% of visitors are on Marshmallow. Given this is a tech blog, that isn’t too shocking to see but an interesting tidbit. And it appears the one of you who were still on Foyo have upgraded! 🙂 I saw no Froyo visitors over the course of the last 3 weeks actually.